If you have a septic system, you may not know your septic system is a very green way of treating your wastewater. The septic system does not just dispose of your wastewater; it treats and then distributes the wastewater in the disposal component for ground water recharge. This way of thinking has become more evident by the passing of the greywater reuse rule approved by the Washington State Department of Health. A greywater reuse system may be installed on properties already served by sanitary sewers in addition to properties served by an on-site sewage disposal system. These systems provide for irrigation/groundwater recharge and can be managed by the homeowner. Rain gardens are one of the most versatile and effective tools in a new approach to managing stormwater called Low Impact Development(LID). A LID project may incorporate several tools to soak up rain water, reduce stormwater runoff, and filter pollutants. Examples of these tools are permeable paving, compost-amended soils, vegetated roofs, rain water collection systems, and rain gardens. 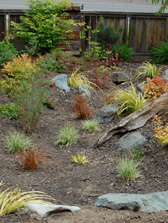 Rain gardens can help clean up the Sound and protect aquatic life. When it rains or snows, more water flows from developed areas than undisturbed areas, carrying oil, fertilizers, pesticides, sediment and other pollutants downstream. In fact, stormwater is the #1 polluter of Puget Sound according to the Puget Sound Partnership - the state agency responsible for the health of the Sound. The added volume of water and associated contaminants are damaging water resources and harming aquatic life. Rain gardens, by infiltrating stormwater into the ground, clean the water and slow its travel to the Sound. Infiltration systems are becoming a viable alternative or supplement to conventional drainage as it has many environmental and economic benefits. Such benefits include reduced peak stormwater flows, reduced downstream flooding, reduced stormwater drainage capital costs, improved groundwater recharge, and improved stormwater quality. Conventional stormwater drainage typically involves draining water from a residential property to a street drainage system. This is great for removing stormwater from a site, but it also contributes to flooding risk, erosion, and sedimentation and water quality decline in downstream water catchments. The modern infiltration systems are designed to minimise clogging by silt material and can be designed to overflow to landscaped areas or the street drainage system when their storage capacity is exceeded during heavy rainfall. Infiltration systems contain a number of pollutant removal mechanisms including adsorption, straining, microbial decomposition in the gravel layer, and trapping of sediment in the pre-treatment areas. If the system is correctly designed, the infiltration system can remove approximately 90 percent of sediment, 60 percent of phosphorus, and 60 percent of nitrogen from stormwater. Where viable, infiltration is an effective means of managing stormwater runoff since it often allows practitioners to address both water quality and water quantity concerns. Stormwater is commonly infiltrated by directing runoff to a variety of engineered best management practices (BMPs) designed to optimize infiltration rates and water quality while minimizing ongoing maintenance needs. Common infiltration BMPs include trenches, basins, bioretention cells, rain gardens, and a growing list of underground BMPs such as perforated pipe, bottomless chambers, and vaults. Two major challenges to using infiltration to manage stormwater runoff are maintaining infiltration rates as the soil accumulates solids and other pollutants over time, and preventing the contamination of groundwater. As such, most regulatory bodies have developed strict design criteria geared toward overcoming these challenges.